It’s a frequent refrain in our business: “The insurer asks that I repair the panel, but I think it needs replacement.” Now you can make repairs easier, faster, and with less body filler. No need to replace the panel. You can repair it with Keco Glue Pull Repair (GPR) products and the pull-to-paint process. These expert glue-pull repair products and educational programs from Keco are the innovative, fast, contemporary way to repair body damage, providing an easier approach than traditional repair methods such as stud welding and panel beating. And the best part: you can pump up your bottom line with just a basic knowledge of how to use them. Conventional methods, although time-tested, are invasive. For a major dent, the technician often has to drill into the panel and weld studs onto it in order to pull the dent out. This damages the surface paint and the panel’s interior e-coat. The technician must put forth the energy to drill into the body and make skilled welds to set the studs. The tech puts forth additional energy in order to pull the dent, plus he must then seal and repair the holes he created – new damage that he must now fix. GPR is much less intrusive and requires less of the technician’s energy. It’s a simple procedure he follows every time that assures consistency and great work. The tech first cleans the surface, then determines the material he’s working with (steel, high-strength steel [HSS], or aluminum). Next, he selects the correct glue tab, glue, and puller tool, applies the glue, adheres the tab, pulls the dent; lifts the lows and knocks down the high points from the surface, and finally skims the body filler, sands, primes, and paints. That’s it! No drilling or welding and the technician expends less energy using Keco’s ergonomic tools. In addition, with GPR, most of the surface paint remains, so the repair requires far less of the last step of sanding, priming, and painting, and the interior e-coat remains pristine as well. An additional plus is that shops do not need separate areas for working on aluminum versus steel. Technicians work on both metals in the same area without concern of cross-contamination. For a general overview and an introduction to glue pulling, go to www.pulltopaint.com. GPR is the contemporary way to repair body damage that takes into consideration high-tech vehicle idiosyncrasies and manufacturer requirements. Because GPR is less intrusive than traditional methods, eliminating stud welding and dramatically reducing panel beating and sculpting, technicians can reduce the need for scanning and re-calibration on high-tech cars. In addition, with repair instead of replacement, GPR allows shops to eliminate long waits for replacement parts so your key-to-key rates are dramatically improved. In the shop when a repair comes in, the technician researches and then recommends the proper repair for that unique situation. Banking on his/her years of experience, know-how, and analysis, an experienced tech is on the front line when it comes to repairs and replacements. 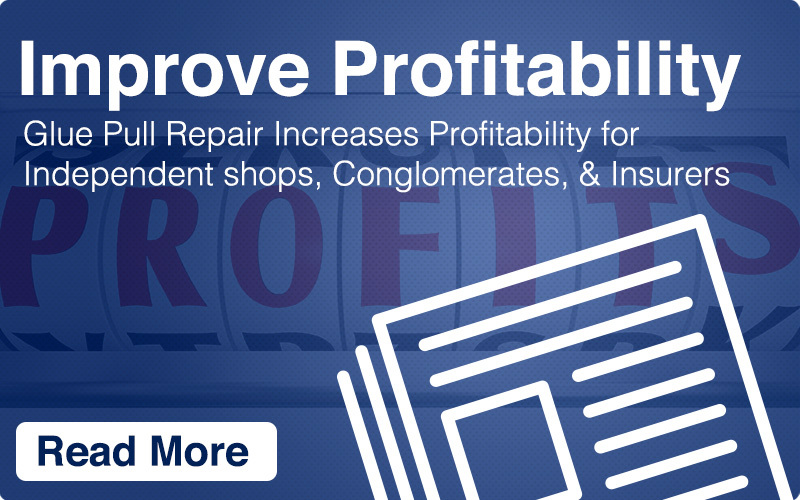 Shop owners depend on the tech’s professional opinion before sanctioning the repair and giving it the go-ahead. Manufacturers, for their part, publish repair procedures that the tech’s recommendations must adhere to and which shop owners must take into consideration before giving the OK. Owners also have to consider that insurance adjusters edit the price they will pay for the repair based on inaccuracies they find in the shop/tech’s quote. It’s a balance that the three vested parties have to maintain to make the business work. After all, if insurers don’t pay, shops go out of business and technicians are out of job. It’s understandable that the technician would rather, in many cases, replace the panel than repair it because it’s easier. But insurers are not going to pay for a replacement when a repair is less expensive. And the shop owner is caught in the middle: he wants to make it easy for his technicians but he also must go along with the insurer’s payouts. So what does this have to do with glue pulling? Keco techniques, products, and training can help attain all three parties’ objectives. While glue pulling may not seem as easy as replacing the entire panel, it’s easier than welding and stud setting. So the tech expends less energy and less time but achieves the same, or better, professional results. The insurer is happy because it pays for a repair rather than a replacement, and the shop owner is happy for both of these reasons, plus s/he has a happy technician and maintains a good relationship with the insurer. Learn how to implement Keco techniques and tool usage, and how to integrate them into your shop workflow for increased efficiency, better repairs, and more profits. Keco offers one-, two-, or three-day, on-location training sessions so your technicians can learn the best-practice GPR techniques from experts, in the comfort of their own shops. These tutorials are taught by our skilled professionals who have years of body and glue-pull repair experience to share. The training sessions are available to body shops no matter their budget. Click for information. Keco, the premier supplier of body repair tools and training, has the tools and accessories you need so your shop’s technicians can repair damaged panels quickly with less effort and time than conventional approaches. 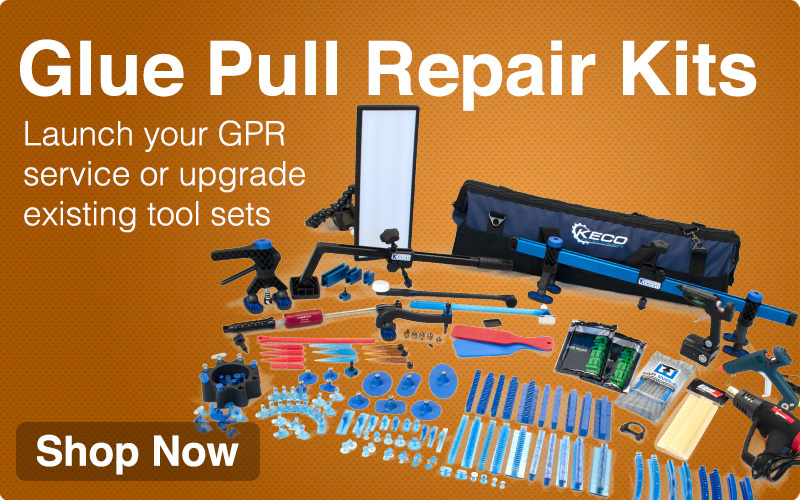 The Keco Glue Pulling Collision and Hail Manager Kit has all the components for one or two technicians glue pulling at the same time and includes everything to launch a professional glue-pull repair service. Kecotabs’ K-Beam Jr. Mini Bridge Lifter with Adaptors is engineered specifically to help you pull deep creases in panels. The bridge lifter’s adjustable feet enable you to work creases with superior control and leverage. Sustained pulling allows you to continue working around dents and creases with knockdowns to release tension on the most challenging repairs. Dead Center Centipede Variety Blue tabs are the thinnest crease tabs available and are designed to get deep into creases. The Keco K-Beam Bridge Lifter has plenty of power while giving you control and leverage. It’s designed to pull large dents from panels, doors, seams, and body lines. The unit’s sustained pulling power frees up your hands so you can view the dent at various angles then slap and knock down crowns as needed. The easy-to-use K-Bar provides the leverage you need to pull large dents and collision damage from panels, doors, seams, rockers, and body lines. Combined with high-strength PDR glue, you can pull the deepest dents from virtually any metal. This extra-large leverage bar works best for quarters and rockers. Contact Keco today. We are happy to schedule training at your facility. Whether you need a one-, two-, or three-day session, our highly-skilled facilitators teach your technicians the latest in glue pulling and body repair techniques that will enable them to work smarter, serve customers better, and help increase profits. 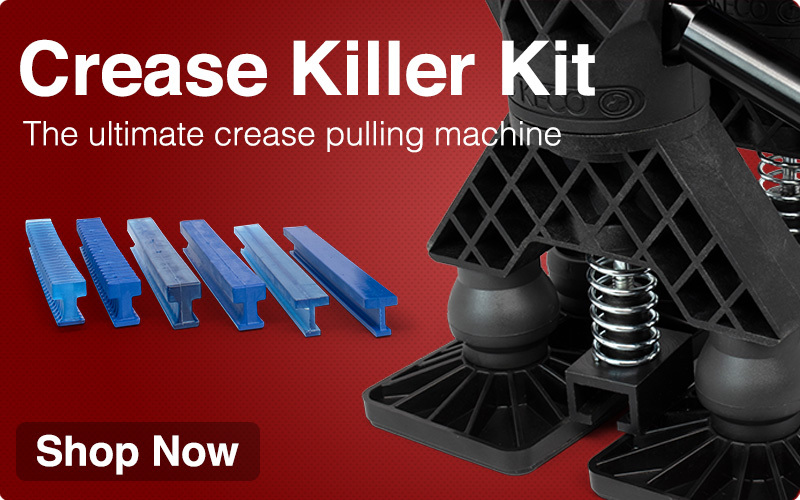 And for tools and accessories, Keco designs and manufactures a full-range of glue pulling equipment and supplies. Order today so your technicians can confidently address the increasing complexity of today’s body repair.